Developing a mobile app is a lengthy process, right? It involves several tasks that need to be completed with regard to requirements gathering, functional or technical specifications writing, design, coding, unit testing, stress testing, alpha testing, beta testing, launch, and so on. So, it is vital to set things right from the start by having an appropriate blueprint (wireframe) for the app being developed. 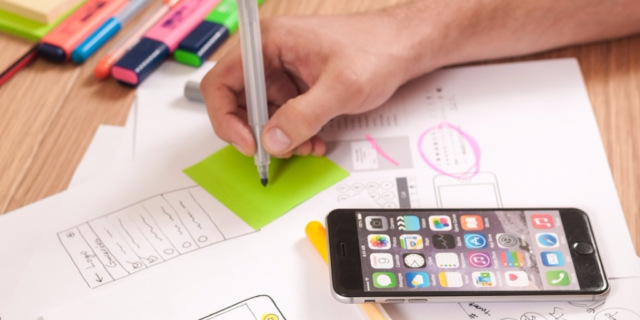 The wireframes serve as a layout or design structure that guides the designers or developers of the third-party android app development companies or their iPhone counterparts that you may hire to turn your mobile app idea into reality. So, wireframes basically direct the designers to the right path as they go about the design and coding of the app (whether web or mobile). They prove useful to the designers in understanding the navigation, user interactions, and overall user experience required for a particular app’s screen design process. But, your designers are likely to deal with two types of wireframes: low-fidelity and high-fidelity ones. And, it would be helpful if you understood the differences between these two types. So, let us dive deep and compare low-fidelity wireframes with high-fidelity ones in terms of their purpose, pros, and cons. Your app or software design team might opt for low-fidelity designs that involve paper sketches, whiteboard drawings or even computer images, which are drawn using some software. Such wireframes can be the preferred option when your team intends to make the wireframes quickly and improve the team communication (within the designers’ team as well as with the client) for a particular software development project. Such wireframes also help your designers envisage the space required for an image through organized blocks as well as support your content writers to get a tentative estimate of the length of the different content blocks through mock content. These wireframes are more refined and comprise a variety of elements, such as images, graphics, color schemes, and logos. They provide a view of the life-like qualities of the design before considering the color and imagery while maintaining focus on functionality. Clearly, high-fidelity wireframes possess more realistic content along with specific typeface choices and have the capability to share specific information on button styles, image dimensions, and so on. These are more of a starting point for a designer or content writer and follow immediately after the site map step. This design stage follows a low-fidelity wireframe. Shows the layout and hierarchy of items. Shows more specific details in terms of dimensions, typeface choices, and so on. Plays around with black and white shapes. Has the option to play with grayscale (hues of gray) in addition to black and white. Comprises more dummy content. Consists of actual content in the form of headlines, subheads, and more. Serves more as an initial brain dump of all potential software design ideas. Serves more as a mid-way benchmark between the initial idea and the final design. Can be made in a very short time span and costs less. Takes longer to be prepared and definitely costs more. Easy to modify as per your requirements and can even be discarded easily to start all over again, without much fuss. Difficult to discard these and start from scratch, as it would be way too time-consuming and even cost more. As a non-technical viewer, you can easily understand this type of wireframe and provide your inputs or feedback. These wireframes are quite complex for non-technical people to understand. They just provide an overview of how the app interface would look and function. They present a much clearer picture of how the final interface would look and work. So, you have seen the importance of wireframing during the app design process. It proves to be your ally in offering the best interface, more innovative navigation, and a greater user experience for your app or software users. While low-fidelity wireframes enable you (as the client) to offer timely feedback and get things right at the initial stage with your app or software development company, high-fidelity ones offer more value and clearer visibility of how the final design needs to look (or would look like). The choice is yours; however, an ideal way would be to start with low-fidelity wireframes and then modify them to create high-fidelity ones. At the end of the day, you should aim to optimize the user experience. So, what do you think will work for you? Feel free to share your inputs or feedback in the comments section below. Shishir is the founder of ChromeInfotech India Ltd., one of the leading android app development companies, globally. With an experience of over a decade, he knows how to manage both people and processes, effectively.